I made this hanging owl plushie for a product review last week and I wanted to share a tutorial with you in case you wanted to have a go too! I originally intended this to be a scented wardrobe hanging but this will work as a decorative soft hanging or a small gift! It is hand sewn due to it's size. Click on the above picture, save the image, and print in order to use the template. Of course if you are a deft drawer you can save the environment and draw these shapes out yourself! 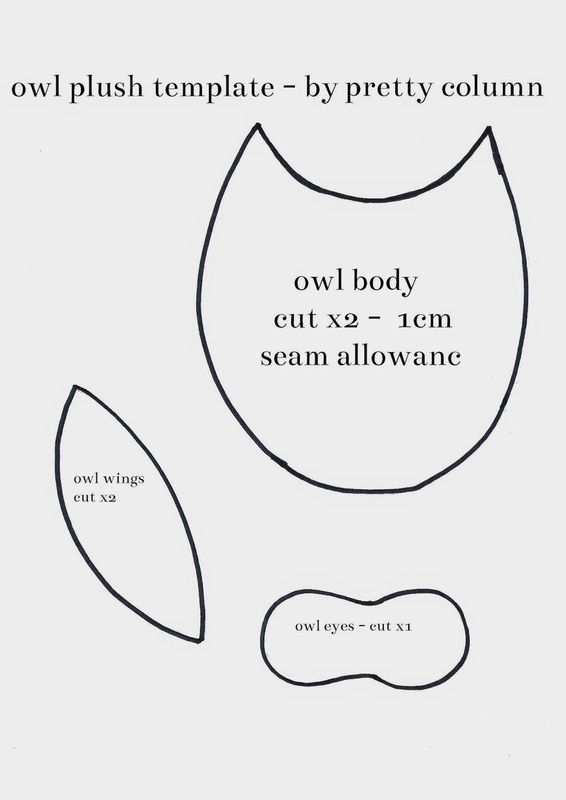 If printed to fill an A4 page you will make the same size owl I have (approx 13cm tall). Position and pin the wings onto one of the cut out body shapes as pictured above with the wings slightly hanging over the edges of the body (so they will be sewn together with the body pieces later). Position and pin the eye piece to the body piece as pictured above. Using a running stitch to match the colour of the ribbon trim secure to the body along the edge of the piece. Using a pencil lightly draw two arrows for eyes and also a beak using above/below pictures as a guide. Using black embroidery thread (I used 3 strands) back stitch the eyes using the pencil line as a guide. NOTE you could use buttons to replace the closed eyes if you so wished! Do the same for the beak with the orange thread around the edge of the beak. Then use satin stitch to 'colour in' the beak. Pin the body pieces right sides together. Cut out a length of your hanging ribbon to the length you desire (mine was cut at approx 25 cm but it was a bit too long, I recommend 20cm). At the top of the owl fold the ribbon in half and pin so the ribbon is in between the two body pieces with the cut ends poking out of the top as pictured above. When you sew the body pieces together now you will catch the ribbon and have a neat finish. 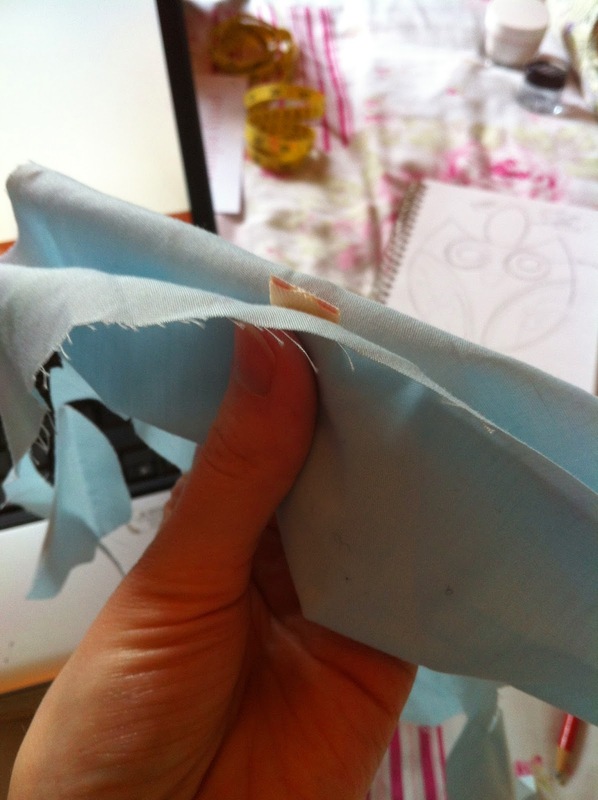 Sew the two body pieces together, leaving an opening somewhere on the body of about 4 cm to allow to turn and to stuff. Turn the owl right side out (your ribbon should be positioned correctly at the top now!) and stuff as firmly as you wish to, making sure you shape the ears carefully. Sew the opening closed using matching thread. You are finished! OPTIONAL I added a running stitch to the top of the owl across his ears to add an extra layer of detail and stability, this is not necessary but you might find you like the effect as you see it on mine. I hope you like this! If you make this owl please please comment and let me know and even email/tweet me a picture! My pleasure ^^ I hope you get some use out of this and would really really love to see any pictures if you make one!!! I love how you stitched his eyes, really finishes the piece off perfectly! Thanks for sharing.